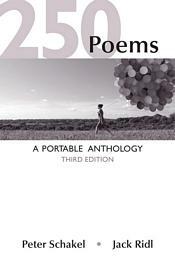 250 Poems: A Portable Anthology offers a brief but surprisingly comprehensive selection of chronologically arranged poetry, supported by succinct, practical editorial features, at a great price. The third edition features 70 new poems, many of them by young contemporary poets, a new appendix on writing about poetry, and an alternative thematic table of contents. Like other volumes in Bedford/St. Martin’s popular series of Portable Anthologies and Portable Guides, 250 Poems offers the series’ trademark combination of high quality and great value for teachers of literature, writing, and creative writing and their cost-conscious students. "The strengths of 250 Poems include its affordability, its breadth in aesthetic scope and range of time covered—and its choice of poems! The poems in this book are GOOD, often just the right classic poem by a particular author. And the book is light and easy for my students to carry around."